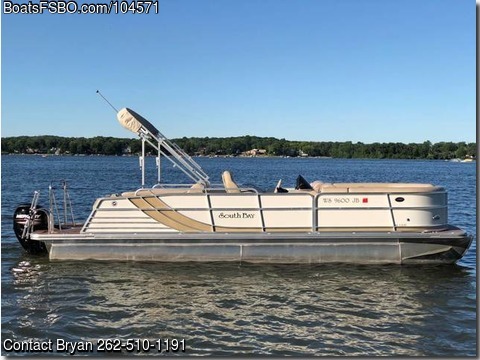 Boat is located in Muskego,Wisconson.Please contact the owner @ 262-510-one one nine one..length overall (LOA): 25 propulsion type: power 2014 South Bay 524SL Pontoon Boat up for sale. We custom ordered this boat at the Milwaukee Boat Show in January 2014 and picked up in May 2014. We have only put on 142 hours so far in the four years weve had it. The boat and the motor still have warranties until May 12, 2019! It is in immaculate conditionwe never leave it uncovered. Options that we ordered include: full teak brown vinyl flooring, matching captain and co-captain chairs, and ski pylon. The boat comes with a 2014 Karavan pontoon trailer. The motor is a Mercury 60 Bigfoot. We keep it on Little Muskego Lake in Muskego, Wisconsin. 100% freshwater and always stored on a lift. It tops out at 20 mph. This is NOT a tritoon. Feel free to message for more pictures!